NAB (National Association of Broadcasters) 99 is setting new attendance records with over 105,000 attendees including 21,000 international attendees. The show floors are packed in all areas and companies are finally buying, since they finally realize that the digital era is NOT going away. The mantra is "Join the digital revolution or get left behind (and go out of business)". Broadcasters and Internet people will sometimes be competing or cooperating, depending how they update their business models. Some companies have indicated that they update them every six months or so -- a few companies are updating them monthly. Both convention centers and the Hilton show floor are bursting at the seams with new and expanded exhibits. NAB 99 represents a huge explosion of both high technology and Internet companies, with many new products and services. The show is morphing into a Comdex/CES/Internet World. The over used term, CONVERGENCE, has arrived. Get ready for a rocket ride -- we haven't seen anything yet. Hughes-JVC's D-ILA high definition projection systems have reached film quality levels and are absolutely outstanding on 30 to 60 foot screens. The display of unparalleled color purity, contrast, brightness, resolution and bandwidth are some of the best in class images I have ever seen. 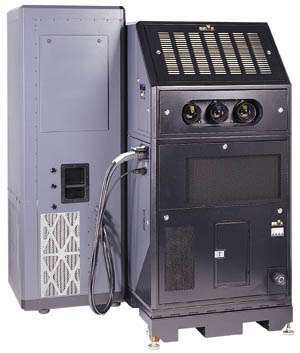 I predict that electronic cinema will soon be in some of your local theaters by late 1999 and throughout 2000. Don't miss it. It's an unbelievable experience. 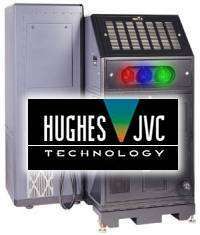 At NAB99, a special screening of Shakespeare In Love was shown to selected press and public in it's entirety -- an industry first for Hughes-JVC. Through an incredible pairing of hardware and software, a lasting impression was left giving us a glimpse into the future. Pinnacle has a non-linear DVD editor at $8,000 which got buyers excited. Sony's multi-million dollar booth is expansive and it appears they are writing significant business and generating strong interest in the near term and also in future products and services. 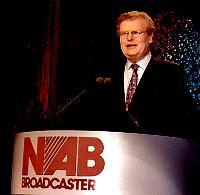 In talking with Howard Stringer, Chairman and CEO of Sony Corporation of America, he said "The first five decades of television have changed our lives", the age of analog has provided the foundation for the digital future. The new digital age will increase television's reach and [its] influence, functionality, creativity and will change the world." "The new world of digital electronics and digital software are the cornerstones of the 21st Century broadcast model." He noted that no company has a monopoly on digitization and Sony is committed to provide the broadest, most robust, and flexible tools to make this digital transformation a success. I feel that he has the vision to "lead the charge" for his company in the near term and beyond. 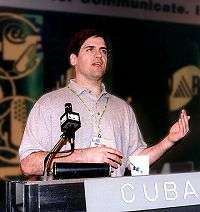 The world's newest, young, hi-tech billionaire, Mark Cuban, of Broadcast.com fame, was equally visionary in two separate meetings. Mark provided his "top ten guideposts" for the digital age. He also emphasized market position early in the digital landscape and to extend growth through properly trained people. It must be working since 50% of Mark's people are new millionaires. And all they work is their standard 9 to 5 day. That's 9am to 5am. Some other key points are that MPEG 2 is becoming the current defacto video standard was well represented at the show. Streaming video is ramping up very quickly, but still requires higher bandwidths.